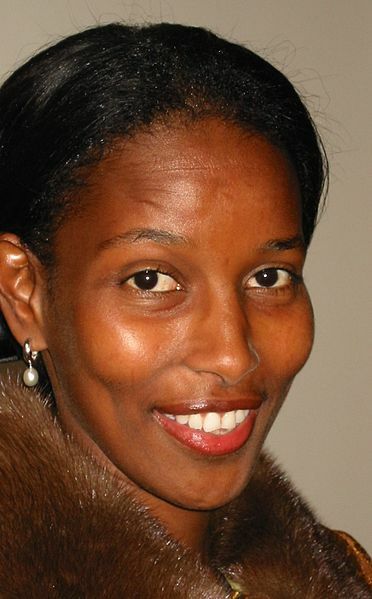 Ayaan Hirsi Ali, author of the memoir Infidel, is an atheist and secular humanist. She rebelled against the oppressive laws of Islam and tradition. Her screenplay for Theo van Gogh's movie Submission led to death threats to her. Theo van Gogh was later, on 2 November 2004, assassinated by an Islamist extremist. The most common definition of religion you will find is the universal quest of humans in search -- in search of the sacred or the holy. That search is expressed intellectually. It's expressed in practice. It is expressed in fellowship. And you look at the religion like Islam, on an intellectual level it was expressed by the founder of Islam as a demolition of all other gods. Polytheism had to end, and all humanity had to be united under one God. From those of you who are familiar with history, and I think a crowd like this is, you know that no monotheistic religion can be a religion of peace. No monotheistic religion is a religion of peace, and definitely not Islam. Monotheistic religions know periods, lengthy periods of peace, but they also know lengthy periods of war. The combination of a history of empire, of conquest, also leaves a legacy behind. And that legacy is the thrusting together of people of different ethnicities, languages, et cetera. So even if that empire declines, the likelihood, the likelihood of conflict, of war, is probable. It's high, especially where there is a fault line. That's where Samuel Huntington had a point. That history of militarism, combined with the legacy of empire, those two points alone belie the motion tonight, that Islam is a religion of peace, but that's not all. When empires decline, those who are defeated, and the Muslim Empire declined, those who are defeated sometimes themselves in a state of victimhood. That state of victimhood is exploited by the leadership or the self-appointed leaders of Islam. And what do you see? You see a number of people, and I concede it's a minority, who believe that Islam is under siege. A mentality of victimhood tells those who are conquered, who are vanquished, that the problem was caused by external powers, not by us, and that systematic denial within Islam after the 19th Century to blame only outsiders exempts Islam from blame, from the explanation what went wrong. Yes, it was external, yes, Muslims were humiliated, yes, they were conquered, yes, they were colonized, but how much was also because of the flaws of Islam?